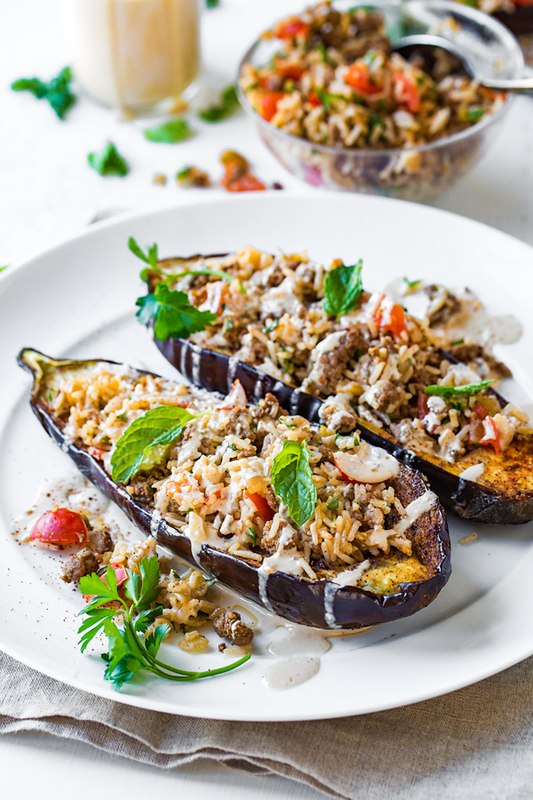 Stuffed eggplant, with all of its comforting and aromatic ingredients, makes for a wonderfully healthy and filling meal, complete with a lovely presentation—always a nice little perk when it comes to food! Stuffed Eggplant, a Lovely Piece of Stuffed… Fruit? Eggplant is one of my all-time favorite—wait, is eggplant a vegetable? A fruit? I suppose I could just call it a piece of “produce”—a nice general descriptor—and leave it at that. But because I’d like to be as accurate as possible for you here, I researched what family eggplant actually belongs to. And believe it or not, it’s considered a fruit, and part of the nightshade family. So I guess I would say that eggplant is one of my favorite fruits, in that case. But no matter its official classification, I treat it like I would a vegetable, and prepare it in all sorts of scrumptious ways to make for a savory meal. I love my eggplant cut into chunks and drizzled with a touch of olive oil, plus some herbs and spices, and caramelized until charred and soft (perhaps with some tomatoes) to make a chutney. I also love it sliced, breaded and lightly fried, and turned into this delectable and crispy eggplant burger. More recently I’ve fallen utterly in love with another tasty little presentation: stuffed eggplant. But it’s safe to say I enjoy eggplant any way I can get it! Part of the joy of preparing a recipe like stuffed eggplant is that the sky’s the limit when it comes to ingredients. You can go completely vegetarian, or you can add a little of your favorite ground meat—beef, chicken, turkey, or even sausage. And it’s up to you whether you’d prefer to use rice, quinoa, farro, barely, or another type of grain as part of the filling. Mixing and matching filling ingredients for your stuffed eggplant is the fun and creative part. For me, I love the flavors of middle eastern cuisine—the warm spices and other interesting ingredients like tahini. So I created my recipe for stuffed eggplant with that flavor profile in mind. I used a little lean ground beef in my filling for the protein, along with fragrant basmati rice, some ground cumin, coriander, a pinch of cinnamon, and paprika for color and kick. I also added some chopped cherry tomatoes for juiciness, and fresh herbs like mint and parsley for a fresh note. And since stuffed eggplant can always benefit from a delicious sauce drizzled over top to tie all the flavors together, I used a little of that tahini to create a savory and spicy garlic tahini sauce with a kiss of lemon. Served with some spicy greens on the side, this meal is one of my all-time favorites, and I hope it becomes one of yours as well—especially if you’re a bit of an “eggplant head” like me! What kind of eggplant to use: Use traditional eggplant for this, and look for ones that are medium-large and rather longer than rounder—these are easier to scoop and fill, and make for a pretty presentation. Choose your protein: Ground beef is my choice for this, but feel free to use turkey, chicken, spicy or sweet sausage, or even ground lamb, another great option. Go vegetarian: Feel free to leave out the meat completely if you’d prefer to go the vegetarian route. Other filling options: I use basmati rice for my filling, but you could also use brown rice, quinoa, barley, or couscous—anything that you prefer. Where to find tahini: Tahini is a sesame paste used in middle eastern cuisine, similar in consistency to almond or peanut butter, and is typically found with those nut butters, or possibly in the International Foods section of your local market. But if you can’t find it, just leave it out and the sauce will still be super flavorful! 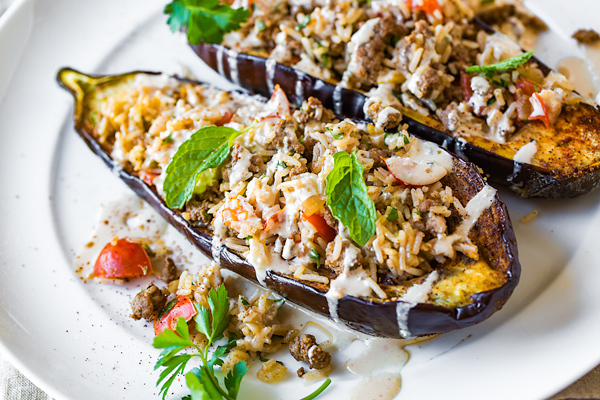 This savory stuffed eggplant with middle eastern spices and a garlic tahini sauce is a delicious and beautiful meal, one full of textures and healthy ingredients. 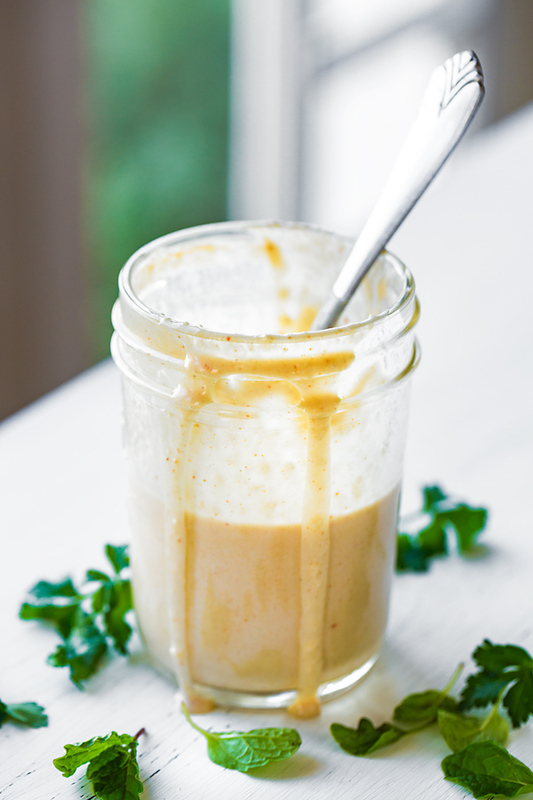 –Prepare your garlic tahini sauce by adding all of the ingredients into a food processor and processing until smooth; pour into a dish, and set aside while you prepare the rest of the recipe. –In a small ramekin, combine the paprika, coriander, cumin and cinnamon, and set this aside this seasoning mix for a moment. –Place the four eggplant halves, flesh-side up, onto the baking sheet, and drizzle about 3 tablespoons of oil (total) over the flesh side of the cut eggplant, and sprinkle over about 1/3 of the seasoning mix from your ramekin, plus a couple of good pinches of salt and pepper; place into the oven to roast until tender and easily pierced with a paring knife, about 35 minutes. 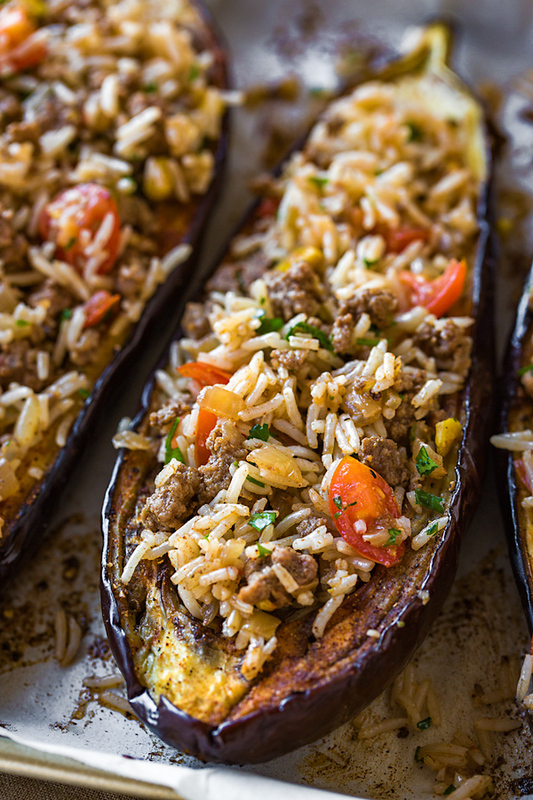 –While your eggplant is roasting, prepare your filling by placing a pan over medium-high heat, and drizzling in about 1 tablespoon of the oil; once hot, add in the diced onion and saute for a few minutes until tender, then crumble in the ground beef and cook that for a few minutes with the onion; add in the remainder of the seasoning mix, along with a couple of pinches of salt and pepper, the garlic and the red pepper flakes (if using), and continue to cook until the meat is cooked through. –Add to the cooked ground beef the cooked rice, the chopped cherry tomatoes, the chopped parsley and mint, plus the pistachios (if using), and fold together to combine; keep warm. –Fill each roasted eggplant cavity with generous, equal portions of the warm filling, and place onto a plate; drizzle over some of the spicy garlic tahini sauce, and garnish with extra mint or parsley, if desired. I love this recipe. I have one question. 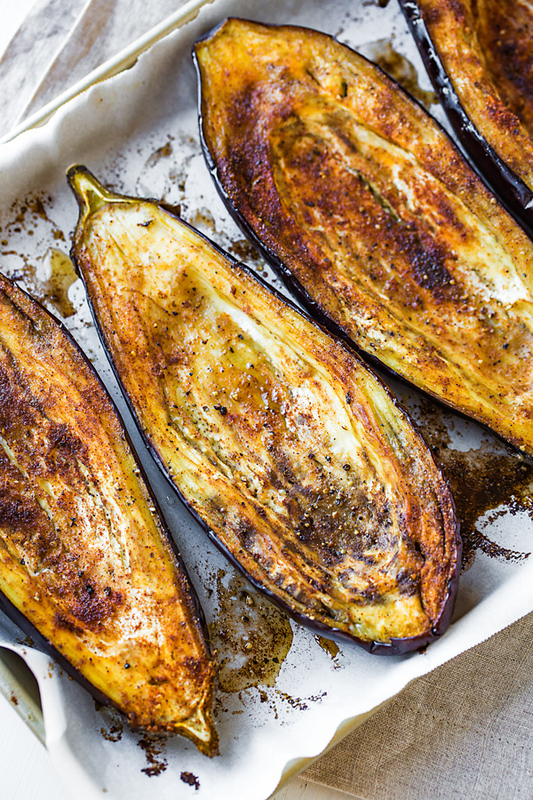 Did you scoop the eggplant before you roasted it or after? Did you use the middle in the filling? Hi Linda! I scooped the middle out prior to roasting, but I did not use it. I didn’t go too deep when I scooped it out, rather scooping mostly the seeded area. You can, however, use that center and chop it up and sauté it with the onions/ground beef, if you desire. Hope you enjoy! Thank you. This is on the menu next week. I think you’ll really enjoy these, Linda! Happy cooking! I just made your stuffed eggplant and didn’t use the scooped out eggplant after I read the previous posts. 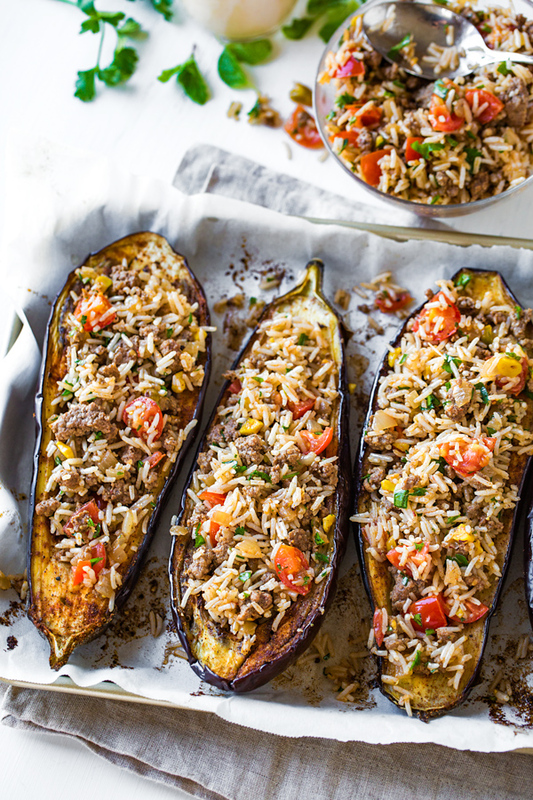 Did you eat any of the eggplant or just use it as a boat to serve the hamburger and rice? I just ate hamburger, rice, tomatoes, spices… a little bland and thought it was going to be more of an eggplant dish. I usually love your recipes but was a bit disappointed in this one. It may totally have been my preparation! I did like the tahini sauce. 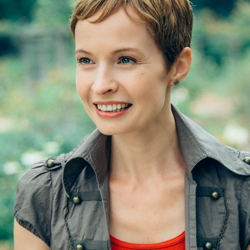 Hi Maureen! Yes, you are definitely supposed to eat the eggplant, as it’s an incredibly tasty part of the recipe. Because the eggplant is seasoned and roasted, the flesh becomes very tender and almost velvety, and is a pleasure to eat with the filling (I cut into it like I would a piece of meat…). I actually eat all of the eggplant “boat”, skin included; but some folks don’t care for the skin and eat only the tender flesh along with the filling. I do hope you try it this way sometime again, because it sounds like you missed so much of the good stuff! Thanks for sharing your experience. ThanksIngrid. I definitely will try it that way! Thanks for your quick response!!! Well I can not wait to make this one for the family. Thank you for the idea. Hi Richard, I’m excited to read that! I hope you all enjoy. This looks great! Cooking right now! I was cooking this ahead for myself to eat through out the week. How would say I re heat this? And do you think I could freeze these as well? Thank you! Hey Emily, I’m so excited that you’re preparing the recipe! As far as freezing, I have not personally tried this—we’ve never had any leftover to freeze, lol! But I have the feeling they might get a little “mealy”. Not certain this would be best for these. Hope you enjoy! I have made this twice, the first time using hot Italian chicken sausage. For the second time around I used the scooped out eggplant and smokey andouille chicken sausage. Delicious both times!!! 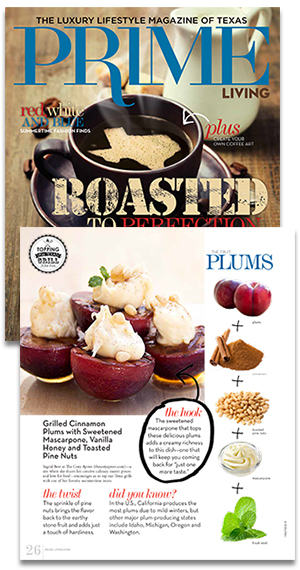 Hey Gerrie, I’m so excited to read that you’ve now made this tasty recipe twice—awesome! Glad you’re enjoying it, and making it your own. The filling ingredients can be very versatile, and the smokey andouille sausage sounds delicious in it! Thank you so much for taking a little time to come back and comment, and share your personal experience with the recipe! Hi Reebs, yes, you got it! Your plan sounds spot on. How long do you roast the eggplant?